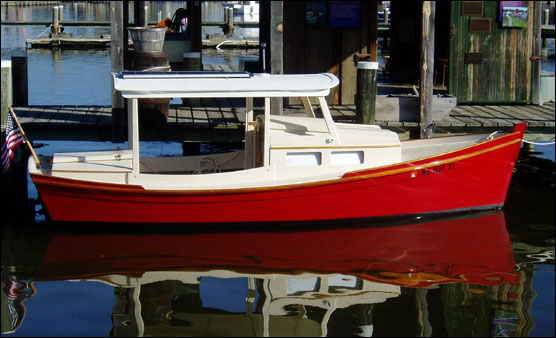 REDWING 18 (SOLD) - Complete boat, built as part of a how-to article for WoodenBoat Magazine [DOWNLOAD PDF description/photos]. 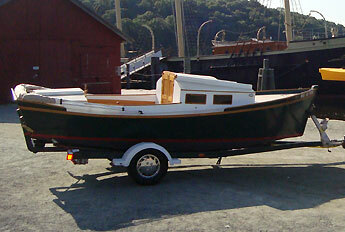 REDWING 18 is based on a Chapelle design of traditional construction. I saw a review of the design in WoodenBoat Magazine (No.82) and set to dreaming about a cruise in the backwater marshes of the Chesapeake's Eastern Shore. Many of these back waters are too narrow for a sailboat to tack but are passable with a small power cruiser. I designed a plywood version and included other changes to make her easier to build while keeping the traditional appearance of the Chapelle design. This design has proven to be an ideal pocket cruiser to exploring creeks, coves and backwaters at modest expense to build and operate. The motor is enclosed for silent running. She is a handy size and weight for trailering behind most cars. Enjoy a relaxing pace of travel on the water. Speed is 6-9 knots depending on power. Look for a design review in Boat Design Quarterly (No. 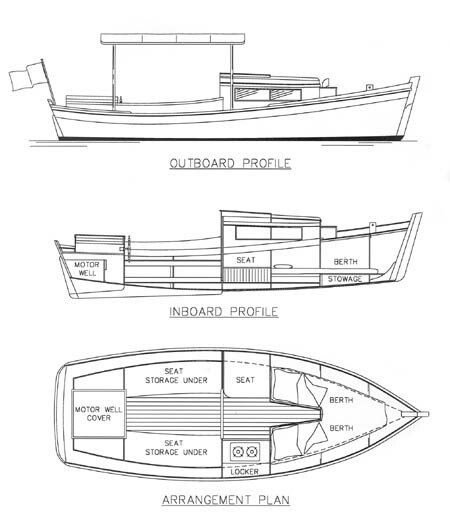 1) and a construction How_to article in WoodenBoat magazine (Issues # 179, 180, 181, & 182 - contact the WoodenBoat Store for these past issues.). Included are plans for both a glue and screw construction version (1/2" plywood and epoxy over straight frames), and a new stitch and glue version. Plans include: materials, lines, construction, and arrangement. A full size frame plan is available. Estimated cost for quality construction materials (not including power) is $10000. This cost includes a high level of outfit and finish you can be proud of after putting the effort into building this fine boat. Check out the Practice Model, How-to Booklet and the Redwings For Sale. Purchase and Download Study Plans for the REDWING 18 for $5.00 in PDF format (zipped file). Purchase "How-To" Booklet instructions for construction of the REDWING 18 for $20.00 for delivery by US Postal Service. 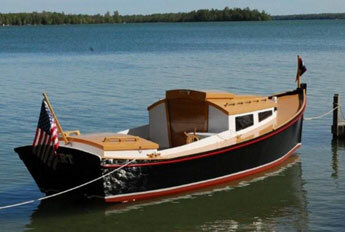 Purchase Construction Plans for the REDWING 18 for $105.00 for delivery by US Postal Service. Purchase Full Size Frame Lofting for the REDWING 18 for $105.00 for delivery by US Postal Service.